Opportunities: I count myself very lucky because I have never been short of opportunities to do what I love. I have been heavily involved in showing pedigree and commercial cattle at shows all over the country, with tremendous success in both open classes and young handlers. In 2015 I had a fantastic year. I achieved a diploma in workbased agriculture, won the young handlers at both Ayr and Perth shows and twice-qualifi ed for the National Young Stockperson final at the Royal Smithfield Festival. I then went on to win the young handlers competition at the Great Yorkshire Show before travelling to Smithfield to become National Young Stockperson 2015. 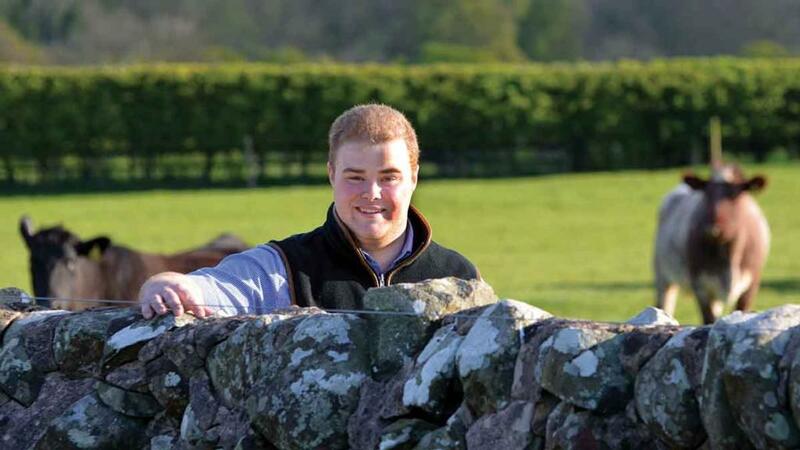 This year I was privileged to be offered a job by the Biggar family, Chapelton Farm, and I am now working with them as a part of their business, learning new skills before I go to Oatridge College in September to study agriculture. It is very important for me to be able to work with a business that is firmly focused on quality and not quantity as I feel that is a major issue in the industry. I have also been chosen to be part of the youth programme at the World Angus Forum when it is held in the UK later this summer. Beef: At Chapelton we work with pedigree Beef Shorthorn cows and pedigree Aberdeen-Angus cows, selling up to a dozen bulls of each breed annually with about half sold privately and the other half sold at breed sales in Stirling and Carlisle. The surplus Beef Shorthorn heifers have been meeting an exceptional trade over the past few years at breed sales, mostly bought by new breeders. Any Aberdeen-Angus heifers not required as herd replacements go to countries such as Germany, Romania, Hungary or France and fetch a good trade. We also have cross-bred commercial cows which are run with both Aberdeen-Angus and Beef Shorthorn bulls. A portion of the Shorthorn and Angus cross heifers are kept for replacements within the herd and the remaining heifers are sold for breeding, many going as recipients in embryo programmes, the demand for which being created by our high herd health status. Brexit: While coming out of Europe, we need to ensure we get a strong trade deal to allow us to continue trading as closely as possible with the EU. Otherwise, we are likely to be at great risk of being undercut by other countries when it comes to selling British produce, particularly beef and lamb. As a Scottish young farmer I realise that 70 per cent of our products are exported to England – 10 times more than what we export to Europe. This is a huge reason for Scotland to stay in the UK rather than in Europe.